Non-profit organization YWCA Dayton used #GivingTuesday as an excuse to give back to its supporters. In Dayton, locals could get a free cup of coffee at Table 33, and in Preble County, The Bistro at Eagles Point in Eaton offered a free cup on Tuesday, Nov. 27. EATON — Non-profit organization YWCA Dayton used #GivingTuesday as an excuse to give back to its supporters. In Dayton, locals could get a free cup of coffee at Table 33, while in Preble County, The Bistro at Eagles Point offered a free cup on Tuesday, Nov. 27. #GivingTuesday is a global day of giving which was started seven years ago by the Belfer Center for Innovation & Social Impact at the 92nd Street Y. The day is always held on the Tuesday following Thanksgiving in the United States. The date follows shopping event Black Friday and Cyber Monday, but instead of buying gifts, the day is focused on giving back to one’s community. The day asks everyday people to donate their time, resources, and talents to effect local change. As a non-profit, YWCA Dayton donates its time every day to help women and men fleeing domestic abuse. In Preble County, YWCA Dayton operates the only 24/7 domestic violence shelter and hotline. It also operates sexual assault and Girls LEAD! programming. The Bistro at Eagles Point is a pay-it-forward restaurant, where patrons do not need money to eat. Customers can choose to pay for their entire meal, their meal and a meal for someone else, or work as a payment. If the customer does not have money for their meal, they can volunteer their time and still eat at the Bistro. Free community dinners are also hosted at the Bistro at Eagles Point. 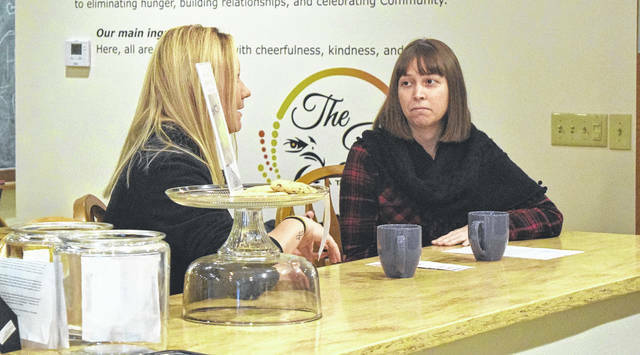 YWCA Dayton Preble County manager Courtney Griffith and Bistro at Eagles Point Front of House Manager and Volunteer Coordinator Nicole Myren kicked off #GivingTuesday with a live-stream on Facebook, inviting everyone out for their free cup. “Giving Tuesday is a day where we encourage people to do acts of kindness, philanthropy, and give to non-profits, but today we are changing things up a bit. As two non-profits, we are giving back to our community, who has supported us everyday since day one, by giving you all a free cup of coffee,” Griffith said. “The Bistro has always partnered with us, from helping us out with our events or giving us gift baskets. They have always been a huge supporter. We wanted to partner with them to give thanks to our amazing Preble County community. You all have given us hygiene products, linens, clothes, shoes – everything you could think of to help our women and children in shelter. For Audrey Starr, YWCA Dayton Director of Marketing and Communications, it was important that the organization gives back to the community in some way, since it is through the community’s support that YWCA Dayton is successful. “We want to make sure our community understands that they are as vital to us as we are to them. We can’t do what we do without their support. We just had a record-breaking month of fundraising in October for Domestic Violence Awareness Month, raising more than $70,000, and we are gearing up for our annual Holiday Market in December for the women and families we serve, so we wanted to pause in between – on #GivingTuesday – and simply say thank you and we appreciate you,” Starr said. In past years, YWCA Dayton has done social media fundraising and direct mail fundraising, but have not held any large campaigns. In the future, officials would be interested in participating by giving back to the community again. “Not sure what that looks like yet, but we definitely want to keep carving out time to acknowledge how important the community is to us and the work we do,” Starr said. https://www.registerherald.com/wp-content/uploads/sites/41/2018/12/web1_Giving.jpgNon-profit organization YWCA Dayton used #GivingTuesday as an excuse to give back to its supporters. In Dayton, locals could get a free cup of coffee at Table 33, and in Preble County, The Bistro at Eagles Point in Eaton offered a free cup on Tuesday, Nov. 27.